Around 8th-9th grade I was finally getting some good friends and became involved in my school activities as well as going to dances, games, and parties. I loved school and friends. It started to bug my dad, and he reprimanded me by not allowing me to hang around them anymore and forced me to attend the new youth meetings happening at my church. I hated it. It was so boring. The religion didn't particularly interest me until the strange experience I had at a later meeting. I lost touch with some of my best friends, and became very involved with my church to the point where I didn't get much sleep at night before school. I hung out with the church kids to the wee hours of the night, and we had a lot of meetings.. a lot! The church was going through what you'd call a "revival" and many so called "miracles" happened at these. It consumed all of my time and left none for real life or school. School wasn't encouraged too much at church and leaders empasized removing ourselves from kids at school and turn our attention towards doing ministry for our occupations. At the time, it was exciting and I thought little of the reality of it all. A reality check didn't come till' I was 18! 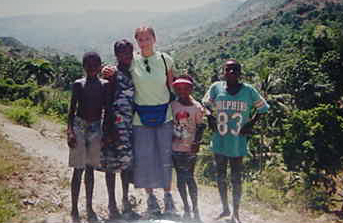 At 17, I went to Haiti on a mission trip where I went with a group to feed the hungry, teach some vacation bible school classes, ministered to the sick at the hospitals, helped build a school, and more things. I was an experience that I can't forget. It was a devastatingly poverish area in which we worked. The people literally wore whatever they could to cover themselves. It gave me a reality check on how priveledged we really are, as Americans to have what we have. 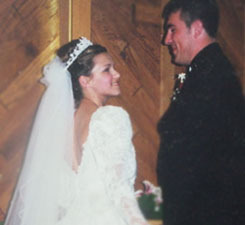 At 18, I married my sweetheart, whom I courted for 3 years. We were involved in Quixstar (stems from Amway company) for many months and were surrounded by positive minded, successful, and wealthy people. It was really cool working with them, but this consumed almost all our time, and I was already working full time and doing home school (my senior year). We decided to quit that and move on to what we planned to do with our lives after we got married. I soon finished my homeschooling, and was solely involved in church ministry. I really though that I was going to do this the rest of my life. Then that fall, we were happy to find that I was pregnant with our first child. Unfortunately, this ended in a deadly miscarriage that nearly took my life. It took many months to recover from it physically and emotionally. Our reality was opened after this and my life changed forever. These were kids who lived up in the mountains. We played kid games with them for a while and then hiked back down to our vehicles. These ones followed me and so we took a pic. Sadly, they really wanted stuff from us, but we didn't have anything to give. Jurrasic Park, any Jackie Chan movie, Clueless, Ace Ventura, Captain Ron, thriller movies.